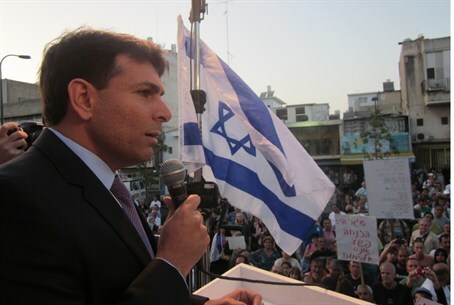 MK Danny Danon: Israel is at war with an enemy state that has established its capital in southern Tel Aviv. Over 1,000 people took part Wednesday evening in a protest against Israel's growing illegal immigrant population. The protesters called on the government to send the infiltrators back to their countries of origin. MK Danny Danon (Likud), who heads the Knesset Lobby to Prevent Infiltration, addressed the protesters and said: "The terrible situation that has formed here has only one solution and we need to talk about it and we must not be ashamed: expel them now!" "The state of Israel is at war with an enemy state that has formed within Israel and has its capital in southern Tel Aviv," he stated. Protesters who live in the working class neighborhoods that are flooded by the illegal immigrants spoke of harassment and physical attacks that have become a daily occurrence. Several cases of sexual assaults against Jewish women have been reported in recent months. Prime Minister Binyamin Netanyahu has reportedly placed pressure on Attorney General and Government Legal Advisor Yehuda Weinstein to issue a legal opinion regarding expulsion of the immigrants. Weinstein spoke with the Foreign Ministry and the National Security Council and is now convinced that the Sudanese immigrants can be repatriated to South Sudan without placing them at risk. He then issued an opinion that the authorities could begin large scale arrests of the immigrants, followed by repatriation. The State Attorney's Office announced Wednesday that it would soon ask the courts to remove a temporary order preventing the incarceration or repatriation of immigrants from South Sudan. The Foreign Ministry has established that infiltrators can be repatriated after individual checks establish that the person being expelled is not at risk in South Sudan. Late last year, Netanyahu said he planned to travel to Africa in 2012 to arrange for the return of illegal immigrants to their countries of origin. He has described the inundating tide of illegal immigration to Israel as "a national calamity" and an "existential threat."